Scientists use the structure of continents to puzzle together how the earth formed. A typical tectonic plate consists of continental lithosphere in some areas, and oceanic lithosphere in others. Mountain belts can provide information about past subduction, which is when denser oceanic lithosphere goes beneath more buoyant continental lithosphere, or suturing, which is when two pieces of continental lithosphere, riding on different plates, collide and create a single, larger piece of continent. However, trying to extract information about the past geometry and location of continents can be tricky, in part because most of the dense oceanic lithosphere, which formerly occupied the space between the continents, is no longer at the surface of the earth. Therefore, scientists have to come up with creative ways to understand the timing and location of these types of events in the earth’s history. Subducted lithosphere is generally not destroyed and can be imaged below our feet using a technique called seismic tomography. By combining this subsurface imaging method with surface geology, which is called “tomotectonic analysis” by Sigloch and Mihalynuk (2017), they can test predictions derived from tomography about the timing and extent of oceanic subduction, and how and when suturing on a continent occurred. These researchers looked at the western coast of North America, where the prevailing hypothesis is that a single, large oceanic plate (the Farallon Plate) has been subducting since at least 180 million years ago, similar to the western coast of South America today. However, new data from the USArray seismic network and other North American seismic stations appear to tell a different story. These data suggest that approximately 2000-4000 km west of the western coast of Paleo-North America was an archipelago of micro-continental slivers, very similar to the area between present-day Australia and Asia. The Farallon plate subducted under the western side of this archipelago, and is imaged in today's mantle under the western U.S., from the surface to 2000 km depth. But another large piece of oceanic lithosphere, formerly the westernmost part of the North American plate, subducted under the eastern side of the archipelago, a situation not previously envisioned, but documented in the tomography by a huge, wall-like pile-up of this "additional" paleo-ocean at 800-2000 km depth under eastern North America and northern Canada. Derived from geophysical observations, this hypothesis makes testable geological predictions. It implies that a suture between this archipelago and the North American continent must exist from Alaska to Mexico. The authors re-examined relevant geological observations from the North American interior, and noted at least 11 “collapsed basins” across the length of North America that contain rocks of appropriate age that are indicative of a past ocean. This “tomotectonic analysis” using both surface and subsurface observations not only gives insight into the structure and evolution of North America, but may also be used to understand similar regions around the world, where continents grew through additions from the colliding plates. Figure 1(A) Areas in the lower mantle beneath North America that have unusually fast regions of seismic wave speed (Sigloch, 2011). The outlined colored areas have the same wave speed and the color changes every 200 km in depth. These areas are believed to be subducted, cool lithosphere that was deposited beneath volcanic arcs and accumulated to form slabs. The 3D image is an oblique elevation view looking across North America from the east-northeast. The 10,000-km-long and near-vertical Mezcalera/Angayucham slab walls in the lower mantle are seen in the foreground. 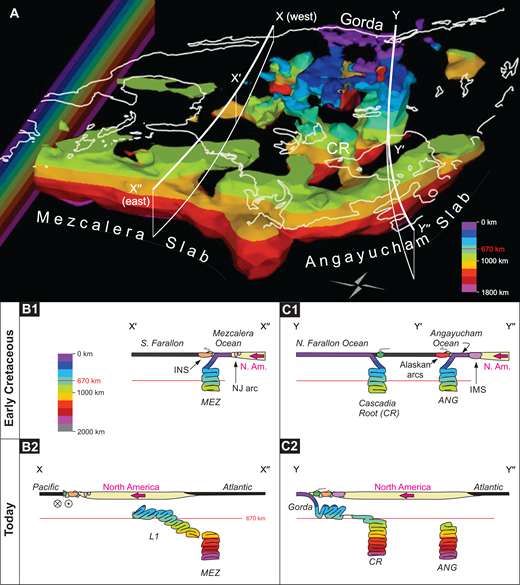 The ocean that they represent (the Mezcalera-Angayucham Ocean) does not feature in the widely accepted subduction history of North America, although some geologists had hypothesized it. In the background (west), the lower-mantle Cascadia Root represents Farallon plate. It is upward-continuous to today’s Farallon/Juan de Fuca Trench in the Cascadia subduction zone (shallowest, purple material). CR – Cascadia Root, i.e. northern Farallon Ocean. (B) Cartoons show interpreted generation of the slabs, drawn to scale. Panels B1 (Early Cretaceous) and B2 (today) show slab and surface evolution along cross section X-X′-X″ of panel A. Panels C1 and C2 show slab evolution under cross-section Y-Y′-Y″. ANG – Angayucham Ocean lithosphere; MEZ – Mezcalera Ocean lithosphere; IMS – Intermontane superterrane; INS – Insular superterrane; NJ arc – Native Jurassic arc. Sigloch, K., & Mihalynuk, M. G. (2017). Mantle and geological evidence for a Late Jurassic–Cretaceous suture spanning North America. GSA Bulletin, 129, 1489–1520. Sigloch, K. (2011). Mantle provinces under North America from multifrequency P-wave tomography, Geochemistry Geophysics Geosystems, v. 12, Q02W08, doi: 10.1029/2010GC003421.